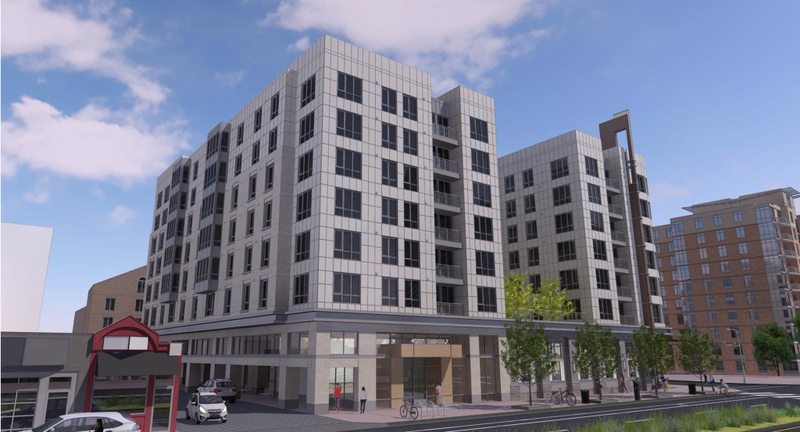 The Arlington County Board today approved a site plan and rezoning at 4201 N. Fairfax Drive for a mixed-use project that will include a new church, daycare facility, multi-family apartments that will include 48 committed affordable units and public art. Part of the Robert Ball Sr. Family Burial Ground will be preserved on the site. The Board also approved a request to designate the burial ground a local historic district. 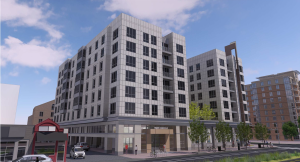 In a related action, the Board allocated approximately $3.1 million in Affordable Housing Investment Fund (AHIF) loan funds to finance the affordable apartments. The existing Central United Methodist Church will be replaced with an eight-story building and two levels of underground parking. The first two floors will have a mix of uses, including a daycare facility for up to 100 children and a church that will seat 200. Additional church space will accommodate charitable mission activities such as provision of counseling, food, clothing and other services to the homeless in association with Arlington Street People’s Assistance Network. The building’s design will utilize façade treatments and fencing to preserve about 500 square feet of the existing burial ground that includes six grave markers. 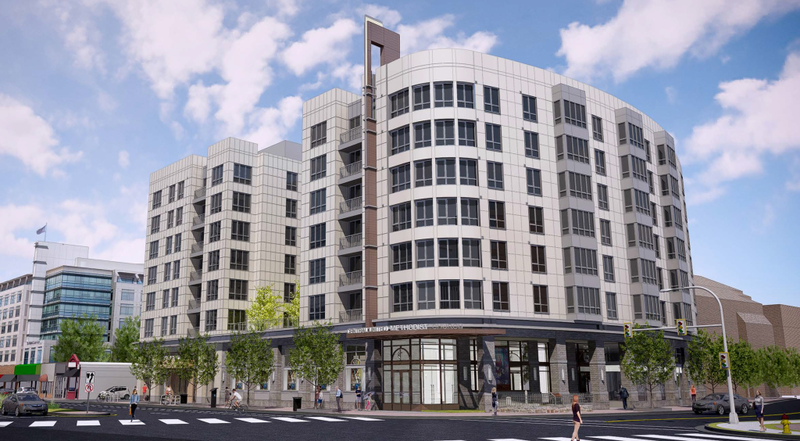 Upper floors will include 119 new apartments, of which 48 will be affordable to households with income at 40%-60% of the area median income for the next 60 years. 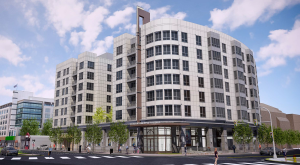 Financing for the project will include use of the County’s AHIF, a revolving loan fund, in addition to a private first mortgage, low-income housing tax credit equity and a deferred developer fee. The Board voted 5 to 0 on all actions associated with this agenda item. To read the staff reports, view item 31 on the Agenda for the February 28, 2017 County Board meeting. The designation of a portion of the Robert Ball Sr. Family Burial Ground a local historic district recognizes the historic value of the 19th-century graveyard, just steps from the Ballston Metro station. The public process regarding the designation began in September 2016. The Ball family, for whom Ballston was named, first platted the ¼-acre graveyard in 1865 when the neighborhood consisted almost entirely of farmland. The first recorded burial occurred in 1854. The extended Ball family remained in what was then Alexandria County (now Arlington) after the Civil War and held prominent positions in local government, politics and civic life well into the 20th century. Local designation provides protection to historic buildings and sites in Arlington, through a zoning overlay and a design review process meant to protect them from inappropriate alterations and incompatible new construction. Nominations, reviews and other preservation matters are overseen by the County’s Historic Preservation program and the Historical Affairs and Landmark Review Board (HALRB). The historic Tiffany stained glass window titled “Christ in Blessing,” will be restored, maintained and displayed for public viewing in the new façade wall abutting the burial ground. The window originally was an ornament of the Abbey Mausoleum in Arlington, a prestigious burial location built in1924. The County was able to salvage architectural features of the mausoleum prior to its demolition in 2001. Numerous attempts to place this window in County projects and private projects have been unsuccessful due to the size of the window and the requirement for public access. The applicant has agreed to restore and publicly display the piece as their public art contribution to the Ballston neighborhood. Prior to the County Board’s public hearings, this project was reviewed by the Site Plan Review Committee, Long Range Planning Committee, Historical Affairs and Landmark Review Board, Housing Commission, Transportation Commission and Planning Commission. For meeting documents and more about the Ballston Central United Methodist Church, visit the County website.